Installations in USA & SINGAPORE. This Core Drill Brazing Machine is an easy-to-use method to accurately braze diamond segments on a wide size range of core barrel sizes. It is equally useful for re-tipping used barrels. 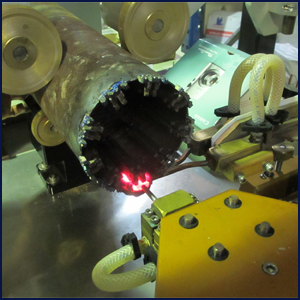 The high frequency induction heating unit quickly silver brazes the segments in 3-7 seconds. Over-heating the segment diamonds is avoided. 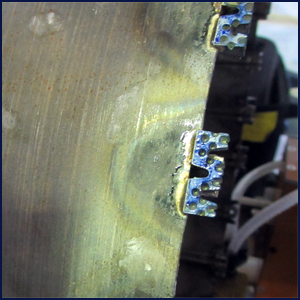 Forward pressure applied against the diamond segment during brazing results in very high bond strength. Diamond segment offset positioning is highly accurate and segment concentricity is superior as a result of the adjustable 5-point barrel fixturing system. Silver solder consumption is reduced to a minimum. Because the MSI Core Drill Brazing Machine is built as a Horizontal Brazing System, very long core drills can be accurately positioned for brazing. Barrel lengths of 1.4 meters (or more) can be brazed easily and with high segment accuracy. Re-tipping of used cores drills now becomes practical and affordable. 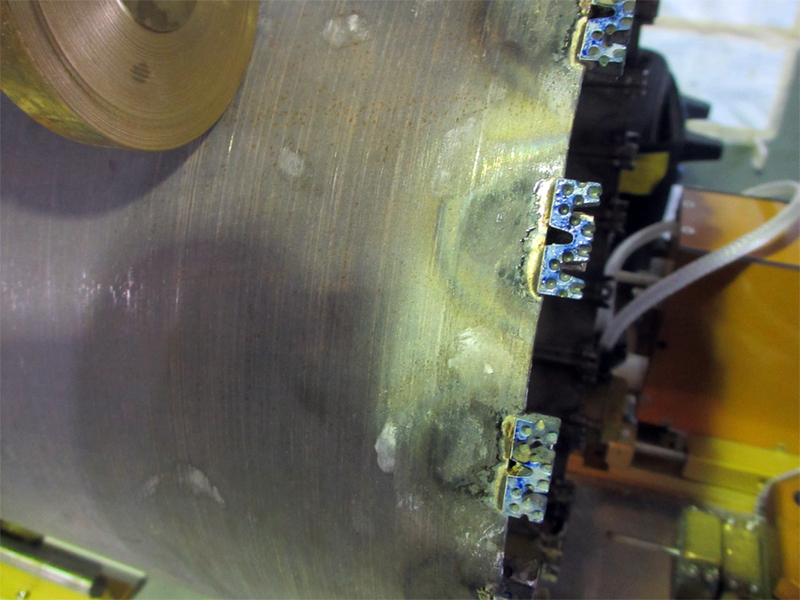 Silver Brazing of the segment is performed by high frequency RF induction heating. (1) Bond strength is very high and superior to torch flame brazing. (2) Since the heat zone can be controlled in a small area, there is less chance of over-heating and damaging the segment�s diamonds. (3) Silver solder consumption is reduced because the silver shim is inserted only between the segment and steel core where greatest bond strength is achieved. 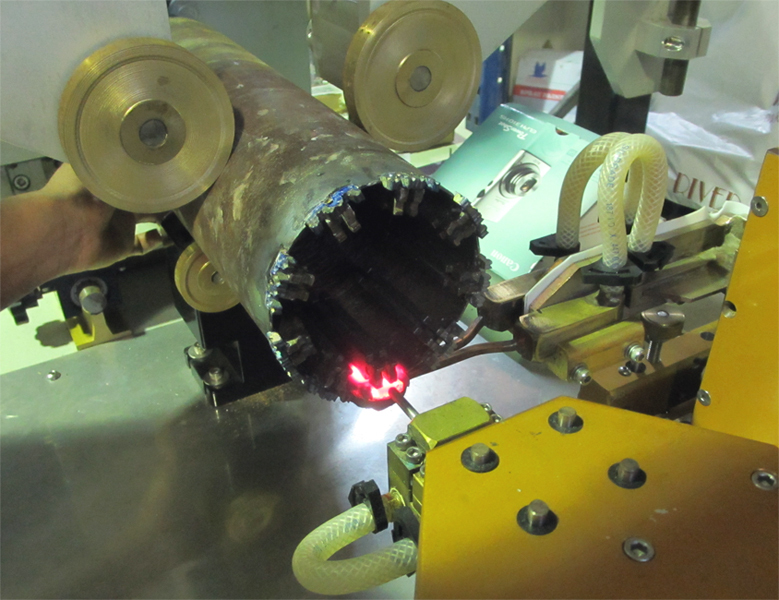 The heating coil is positioned under the core drill and diamond segment. This allows full access and unobstructed viewing of the heating while in progress. Rotation of the core from one segment position to the next is easy and by hand. A typical 105 mm core drill with 9 diamond segments takes less than 2 minutes to induction braze. 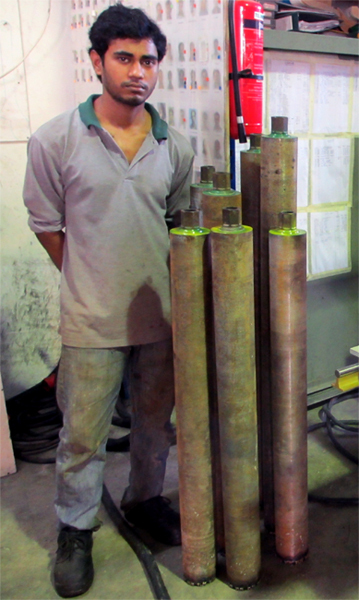 A 350 mm core drill with 20 segments takes less than 5 minutes to braze. 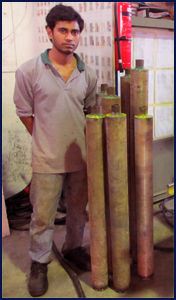 All segments are brazed accurately and the concentricity of the core drill after brazing is excellent.